Things to Do in and around Port Arthur - A travel guide. If you’re visiting Tasmania, it’s almost inevitable that you’ll end up being completely enthralled by the island’s fascinating history. In fact, many people visit the ‘Apple Isle’ solely for the historical experience. Port Arthur is one of Tasmania’s premier destinations because, not only does it have the sought after historical significance, but the astounding natural beauty too. In fact, we’d go as far as to say that if you’re only able to visit one destination in Tassie, make it Port Arthur! Here are some of the things you might see on your visit to Port Arthur. 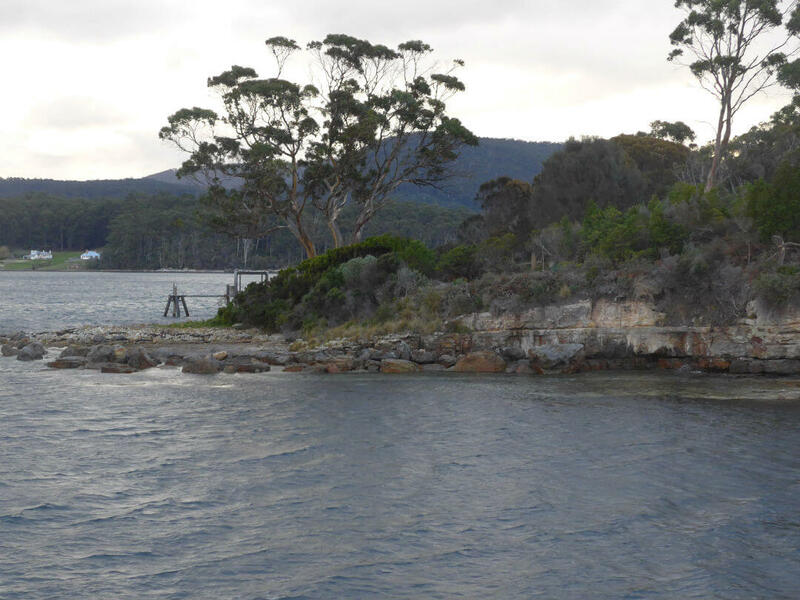 One of the first clues that you are approaching Port Arthur is actually over 10 kilometers from the Port Arthur Historic site. 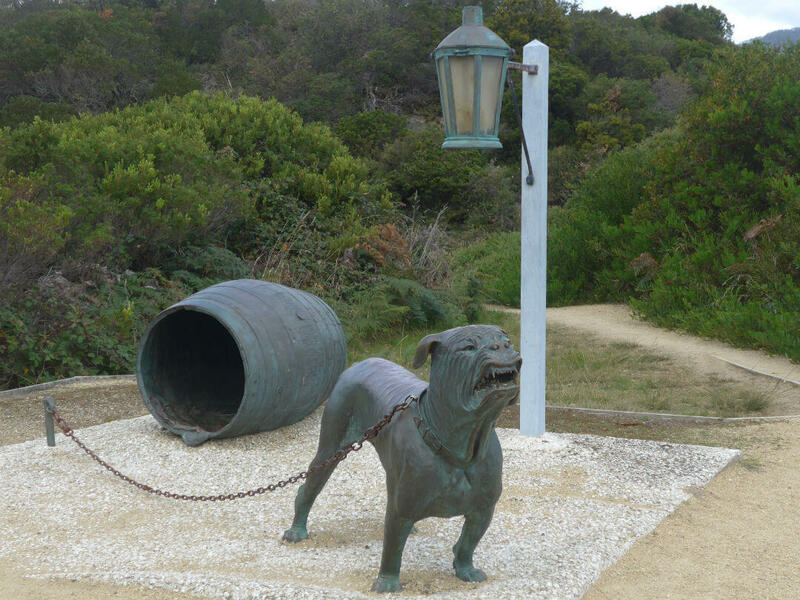 To prevent any escaping convicts from reaching the main settlements in Tasmania a Dog line was set up at the Eaglehawk Neck isthmus. Here were stationed, eventually, 18 dogs chained separately near small kennels. To prevent escapees from wading past the dogs some dogs were stationed on platforms in the shallow water. The area was also covered in shells and lit by lanterns to further aid the detection of escapees. Today there is a monument to remember the dogs, the guards the the prisoners who tried to escape. It serves as a stark reminder of the conditions endured in the early days as a penal settlement. 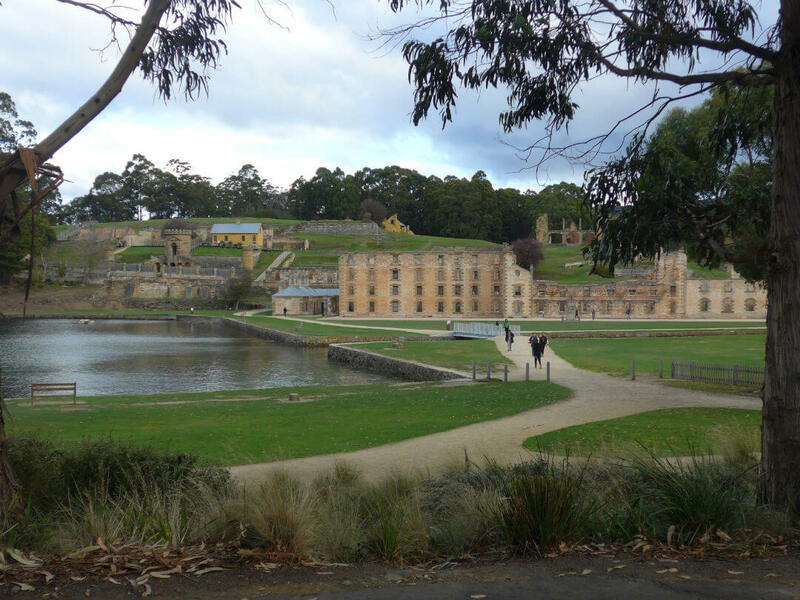 The Port Arthur Historic site covers over 40 hectares and is Australia’s best preserved convict settlement. Some of the buildings are just the brick shells whereas some buildings have been preserved and restored. Walking around the beautiful maintained gardens and paths hides the harsh conditions the convicts must have endured as various methods were attempted to ‘rehabilitate’ them. The Isle of the Dead is an island cemetery located adjacent to Port Arthur and used during the time the prison was open. While fairly small in size, the island has around 1,646 convicts and free men and women interred within its land. Unsurprisingly for that time, of the huge number of graves on the isle, only those belonging to prison staff and military personnel – totalling about 180 graves – are marked.The Isle is another location that invokes strong emotions in its visitors, with many people feeling a sense of melancholia and some a sense of tranquility and peace. Despite the macabre purpose for the island, it is really a visually attractive place and well worth the ferry ride over. Once there, your guide will show you how the island was separated into two sections – the higher northern end for the ‘respectable’ staff and military burials and the lower southern end for the prisoners. You’ll also hear stories of some of the island’s interred and the people who buried them. The section of Port Arthur known as the Point Puer Boys’ Prison is arguably the most heart wrenching location within the settlement. Around 3,000 boys were held here between 1834 and 1849, with the youngest being only nine years old. 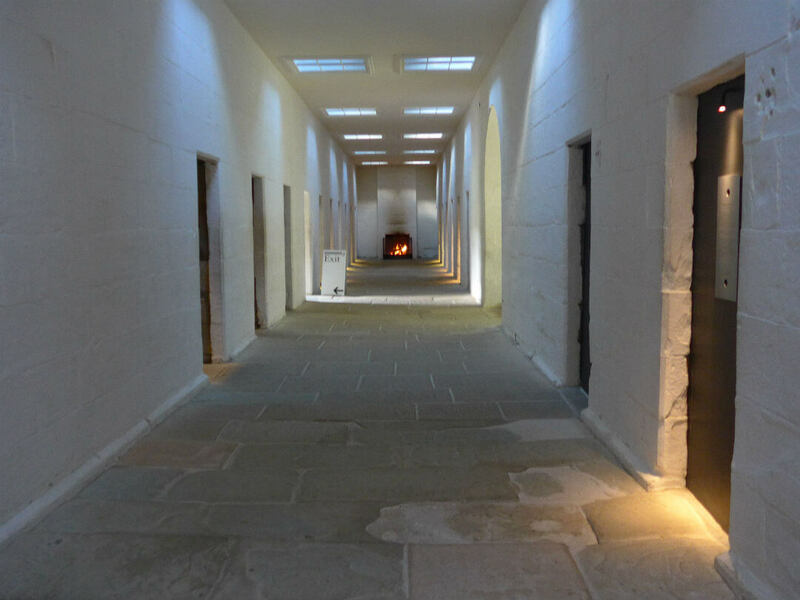 While the young boys incarcerated here were taught practical skills (such as trade skills and basic education) in anticipation of their release, this experimental juvenile reformatory – the first of its kind in the British empire – was just as harsh – if not more-so – than that of the adults.A visit here will allow you to learn about some of the harsh punishments, stern discipline and everyday survival of these poor boys, who were often already completely heartbroken by their separation from their parents and other family. You’ll also learn about the lives of some of the boys after their release from Point Puer. Whether you believe in the afterlife or not, Port Arthur at night is enough to scare even the most hardened sceptic. As darkness falls, your tour group will be escorted through some of Port Arthur’s most haunted sections, illuminated only by lantern light. You’ll hear the stories of those who supposedly cannot ‘find the light’ and still dwell within the place they died.You’ll also hear about all of the bizarre and frightening occurrences that have given Port Arthur the reputation as one of the most haunted places in Australia, with the earliest paranormal encounters reported around 1870. This tour is not for the faint hearted; however, it’s quite a lot of fun and an experience you’ll never forget! Want to find out more about Tasmania? Including our favourite tours, latest specials, travel information and plenty more. See our Tasmania Things to Do Travel Guide. 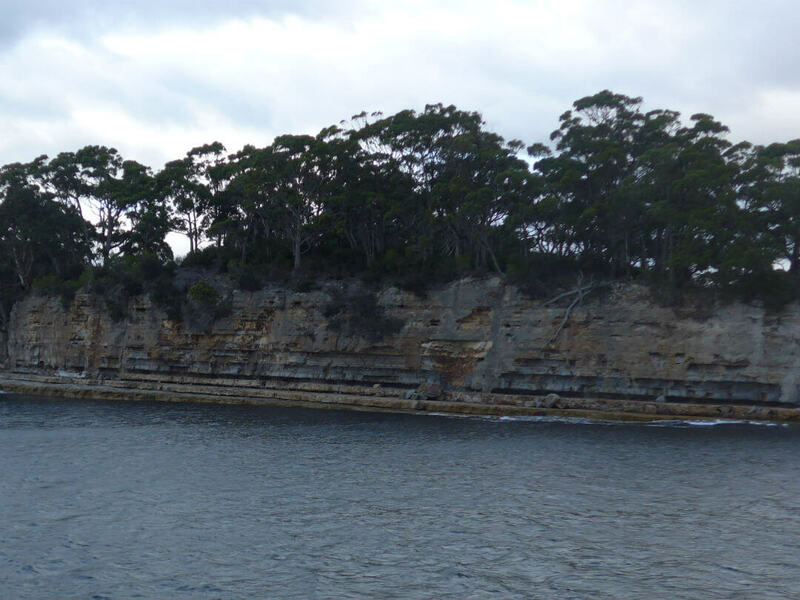 For those who really want to immerse themselves in the scenic natural beauty of Port Arthur, a three-hour wilderness cruise will definitely hit the spot. 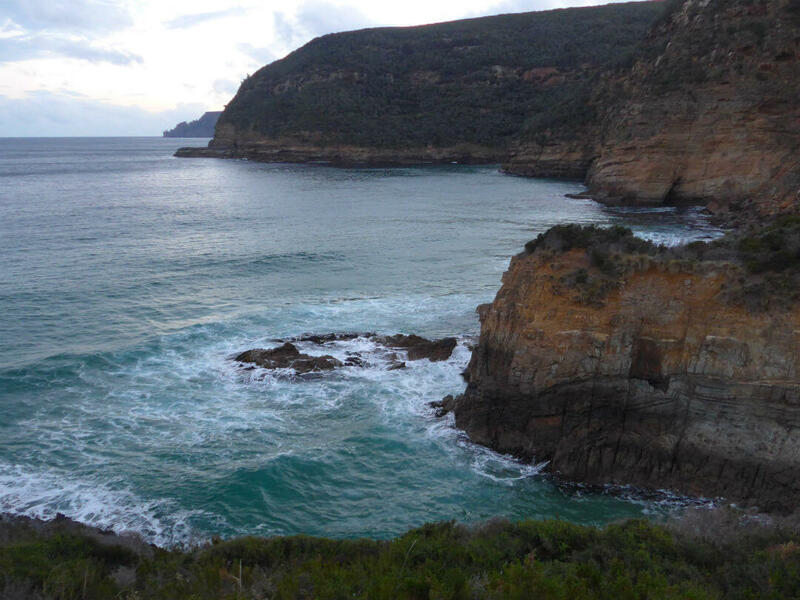 Travelling along the coastline between Port Arthur and Eaglehawk Neck, you’ll see some amazing natural rock formations, waterfalls, sea caves and archways, carved put by thousands of years of ocean erosion. Your friendly, professional guide will point out a variety of native wildlife species, including sea birds, whales, seals, dolphins and more.Bird watchers will be thrilled with frequent sightings of sea eagles, albatross, gannets, peregrine falcons and cormorants, to name a few. This tour is perfect for lightening your mood after hearing the stories of woe from the convict settlement. About 7 kilometers from Port Arthur is Remarkable cave. The cave has been formed by the erosion from the unrelenting seas. To access the viewing platform you will need to descend over 130 stairs. 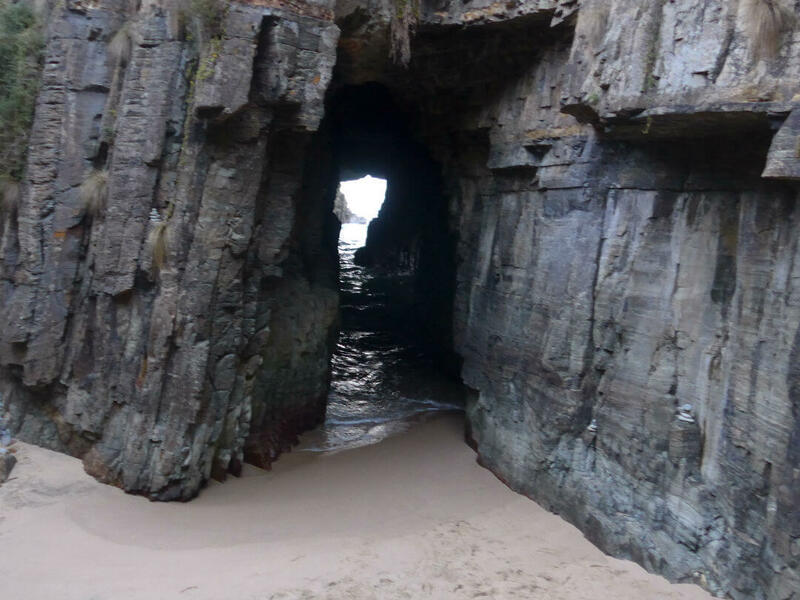 The viewing platform is located in an area where the cave roof has collapsed and vision of the cave changes with tide and sea conditions. Under the right conditions the caves can show a ‘remarkable’ likeness to a map of Tasmania. Descending the stairs can be quite strenuous and many people choose the equally inspiring views of the coastline from the Maingon Bay lookout.